Nissan Pathfinder Family SUV 2018 Update: Nissan Pathfinder was introduced back in 2013. It was redesigned, reimagined, reengineered and was the first among the SUVs that adopted the crossover platform. Back then SUV’s were considered specialty vehicles to do the chores and Nissan’s catalog were full such vehicles such as mighty Patrol and the smaller yet rugged and capable Xterra (now defunct). 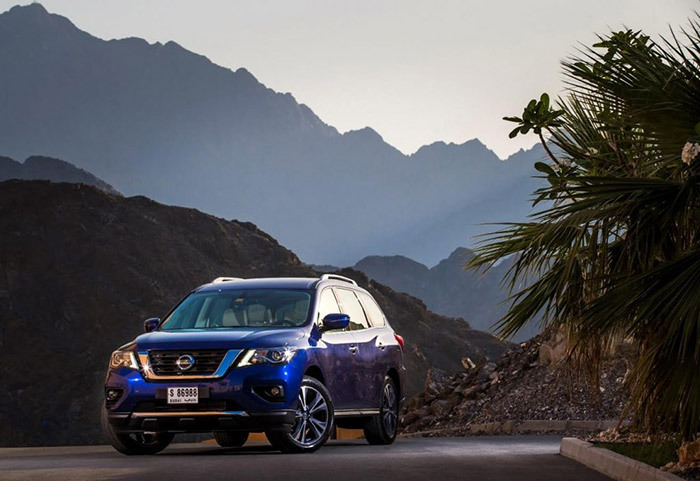 Nissan’s idea was to make Nissan Pathfinder Family SUV 2018 more as a family oriented car that on a weekend the family members can enjoy a ride in comfort and reach out to accessible yet adventurous terrains and picnic spots. That was done effectively in 2013 and we were there at the time of Pathfinder launch. Now fast forward to the present day, Last week Nissan reintroduced Nissan Pathfinder Family SUV 2018. Nicely refreshed and updated to align it with other cars carrying the new corporate design. from boomerang headlights that feature LED daytime running lights and large V-motion grille and sculpted bumper fitted with darker accent fog lights which add the bolder look that SUV requires. Most importantly the bumper now features active grille shutter for improved aerodynamics and also helps in returning better fuel economy. Moreover, the front bumper also provides deeper approach angle for off-road driving conditions. Just like the exterior, the interior space of Nissan Pathfinder Family SUV 2018 is also refreshed and upgraded with modern tech. from refined ergonomics to the best in class accordion style EZ Flex Seating System with Latch and Glide a 2nd row tilt and glide seat that allows easy 3rd-row access with a child safety seat remaining securely in place in the 2nd row. A standard 8.0-inch touch-screen monitor, situated in the middle of the instrument panel controls a wide variety of vehicle systems and settings including navigation and infotainment functions. Adding the new zing for the driver, the Pathfinder can be started with remote (standard on SV and SL) which further allows to switch on the aircon. A feature which is so much desired before one place their bottoms in the roasting summers of the UAE. Pathfinder also offers available class-exclusive Intelligent Around View Monitor (AVM) with Moving Object Detection (MOD). Other available technology includes Tri-Zone Automatic Climate Control, Bluetooth mobile phone connectivity plus iPod integration. The tri-zone Family Entertainment system includes front seats head restraint-mounted DVD display screens. The rear displays are now 8-inch QHD designs and include auto brightness control and USB and HDMI rear source inputs. The rear display can be easily controlled from the front with a more user-friendly display. 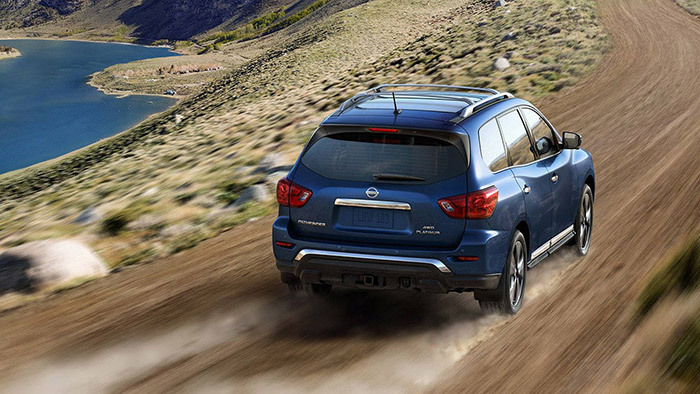 This time around Nissan Pathfinder is equipped with the upgraded engine. the new 3.5l – V6 features Direct Injection Gasoline (DIG) system now packs more power and grunt. Thanks to the 60 percent new parts the engine produce 284 hp and 259lb-ft of torque. The 2018 Pathfinder now comes equipped with the third-generation Xtronic transmission. The Xtronic transmission includes DStep Logic Control, which simulates shifts, giving a more linear acceleration feeling. 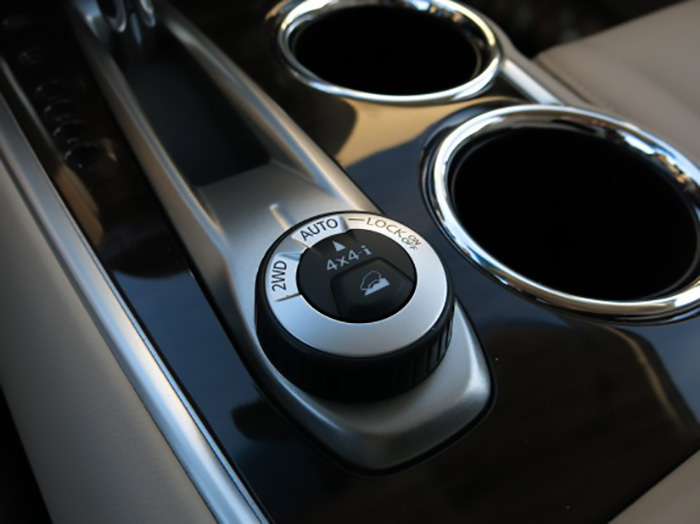 To provide the peace of mind during the off-road driving conditions Pathfinder has selectable 2WD, Auto or 4WD Lock modes from the intuitive ALL-MODE 4×4-i system. Nissan says that Pathfinder is the only vehicle in class with selectable 2WD, Auto or 4WD Lock modes for its available intuitive ALL-MODE 4×4-i system. The system lets the driver choose full-time 2WD for maximum fuel economy, Auto mode to automatically monitor conditions and adjust the balance of power between the front and rear wheels for best traction, or 4WD Lock mode when full-time 4WD is desired. Adding extra zest in the color palette with the addition of Caspian Blue other the available five colors: Silver, Gun Metallic, Magnetic Black, Pearl White. Also updated in the 2018 model is the design of the allow wheels that are available as 18-inch in S grade and 20-inch in SV and SL grades. The refreshed Nissan Pathfinder will be arriving in showrooms across the region in May. The 2-wheel drive is priced between USD 32,450 and USD 44,240, while the 4-wheel drive between USD 34,360 and USD 46,090.